Multi-Definition Down Up Cross Mini Converter. 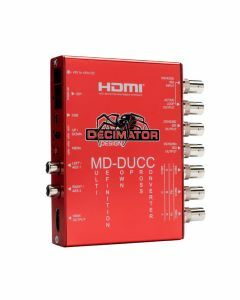 The MD-DUCC from Decimator Design is a must have for any broadcast professional; the variety of functions it performs eliminate the need for several products. Input any format of SDI and select whatever output format you require - whether in SDI, HDMI, or analogue. The MD-DUCC is controlled either via USB on a Mac/Windows app or on-unit using the dip switch.Â The unit comes with a Locking DC Power Supply, HDMI Cable & Mounting Bracket. Warranty for all Decimator Design products is 3 years. Any of the 4 audio groups individually selectable. AES, VU, Extended VU, BBC, EBU, DIN and NORDIC Scales. Bar & Float, Bar only or Float only. Separate enables for Safe Action, Safe Title and Centre Cross. Adjustable position for either Safe Action or Safe Title. Adjustable colours for Safe Action, Safe Title and Centre Cross. Adjustable Foreground and Background colours. +5V to +24V DC, ~5 Watts.